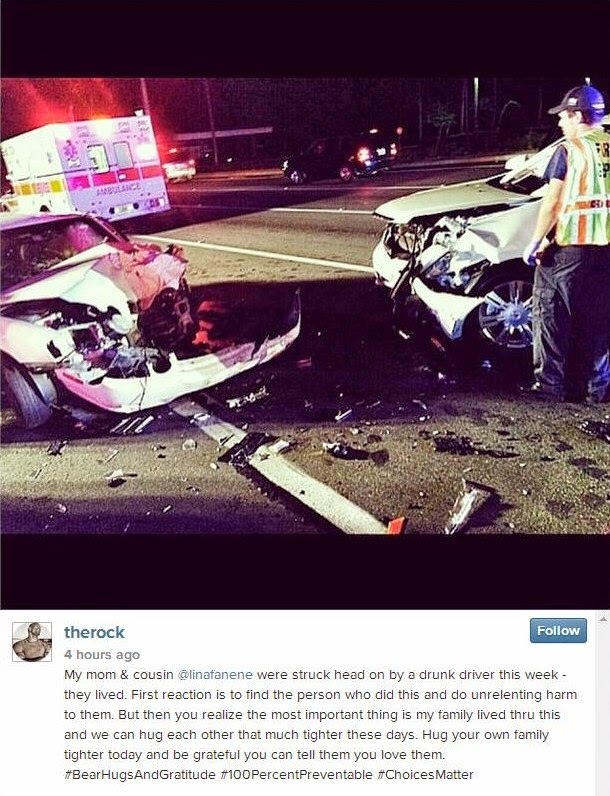 Dwayne Johnson's mom and cousin were in a serious accident this week when a drunk driver hit them head on, according to the wrestling star. Johnson posted a horrifying picture of the wreck to Instagram on Sunday. Johnson, 42, is very close to his mother, Ata Johnson. His cousin, Savelina "Lina" Fanene, is a WWE Diva. "My mom & cousin...were struck head on by a drunk driver this week - they lived," he wrote in the post. "First reaction is to find the person who did this and do unrelenting harm to them." "But then you realize the most important thing is my family lived thru this and we can hug each other that much tighter these days," he continued. "Hug your own family tighter today and be grateful you can tell them you love them." He signed off with three hashtags: #BearHugsAndGratitude, #100PercentPreventable and #ChoicesMatter.